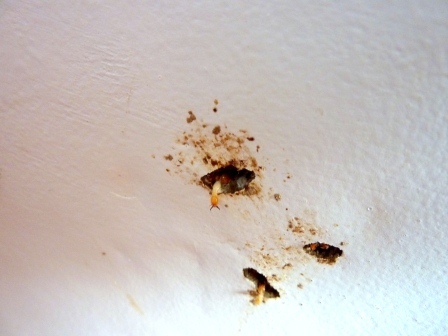 Carli Stojanovic from Paramount Real Estate- NSW forwarded this photo of not just termite damage, but the actual termites crawling out of a wall hole inside a rental property! As property managers, this is a very serious situation as termite damage is a formal exclusion to building insurance policies and can costs many thousands of dollars to fix, all at the landlord expense. Really the best ‘protection’ we have is to insist that landlords have their property checked by a professional termite specialist every year for possible infestation signs, and also ‘weak points’ around a property that could allow termites easy access into the property. Thanks, Carli for this very rare photo.